Too Faced is all about the cute packaging so it comes as no surprise that their intro to the highlighter game is all glitz and glamour. They may be a little late to the party but Too Faced managed to dazzle us all with their new Love Light Prismatic Highlighters. The Love Light Prismatic Highlighters are everything you’d imagine a Too Faced highlighter to be. Shiny, a little gaudy, maybe a little cheap but still hella cute! I can’t lie. The new Too Faced Love Light Prismatic Highlighters are super gaudy. But they’re so much fun! The shiny metallic packaging and jewel embossing reminds me a lot of those old chunky costume jewelry necklaces with the heart pendants in them. LOL! The packaging may be a bit retro and maybe a little childish but I actually dig it. Of course, they’re not going to be everyone’s cup of tea though. So you’ll probably want to pass on these if you’re looking for something fancy and sophisticated to pull out of your makeup bag. Too Faced whipped 3 shades of the Love Light Prismatic Highlighters with the lightest of the bunch being Blinded By The Light. Blinded By The Light is a pale pearly champagne with floating multicolored holographic shimmers. In the pan, Blinded By The Light looks too pale for us chocolate cuties but it actually works just fine. I still think it works best for fair to light skin tones, though. The pale champagne base is sheer so it doesn’t translate much on the skin. Instead, you’re left with a soft pearlescent glow that can be worn sheer for a natural glow or be built up to the moon. Love rose gold highlighters? Then Ray Of Light will probably have you feeling all giddy inside! Ray Of Light is a peachy pink rose gold with holographic glitter that’s great for medium to dark complexions as it’s not too light and doesn’t offer a lot of color. Like Blinded By The Light, Ray of Light is a bit more on the sheer side so you’re mostly getting all that pretty holographic glitter without feeling like a disco ball. You can’t release a line of highlighters without including a poppin’ gold for us melanin goddesses! Too Faced rounded out the Love Light Prismatic Highlighters lineup nicely with You Light Up My Life. It’s a rich gold with the same delicious holographic glittery goodness that us highlighter junkies love. Of course, You Light Up My Life is my favorite of the 3 because it’s the most flattering on my brown skin. I also find it to be the most pigmented too. If you’re looking to try one of the new Too Faced Love Light Prismatic Highlighters I’d recommend checking out You Light Up My Life first! 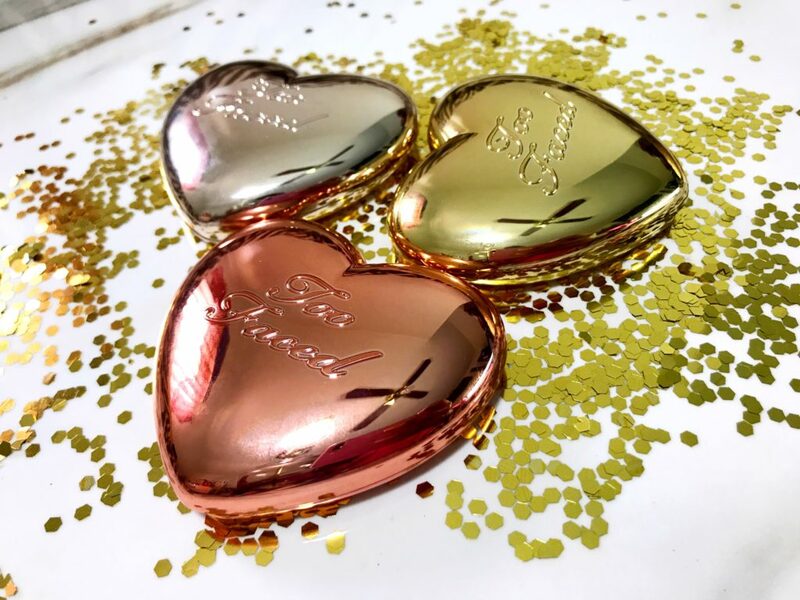 Have you tried the new Too Faced Love Light Prismatic Highlighters?